Choucroute Garnie is French for dressed sauerkraut. It’s a dish originating from Alsace in France, and it’s the perfect dish to celebrate fall and Oktoberfest. I make Choucroute Garnie every fall, and my family loves it. All the different kinds on sausages and pork meat, cooked together with sauerkraut, white wine, apple juice and spices makes it an unforgettable and amazing dish. 4 pounds of meat (thick slices of ham, large slices of pork chops, different kind of smoked sausages like Polish, Kielbassa, Knockwurst, Bratwurst…) Don’t hesitate to cut them if you want. Place the rinsed and drained sauerkraut in a large baking dish. In a large frying pan, melt the butter and fry the meat. Place the meat over the sauerkraut. Fry the onions at medium heat for about 5 minutes (without browning). Add the wine, apple juice, apple cider vinegar, allspice salt and pepper. At that point, you can refrigerate until ready to cook. Serve with different kinds of mustards, sour cream, boiled potatoes, white wine or beer. This dish looks amazing! It has all of my favorite ingredients! I’ve never even heard of this dish, and spent a good portion of my youth in West Germany (and LOTS of Oktoberfests). Have to try it! It’s simply delicious, and really easy to prepare. This looks so tasty. My husband is a huge fan of meat. I have to try this recipe. Let me know what your husband thinks! Hmmm… this is a new and interesting dish to try! My hubby and sons love bratwurst and kielbasa. Having to add bacon to their favorite sausage would be heaven for them. Thanks for sharing! It is different and delicious! This sounds very interesting. I may try this new recipe at our house. This is a very interesting dish. I think the taste of it must be very unique and I would love to taste it. 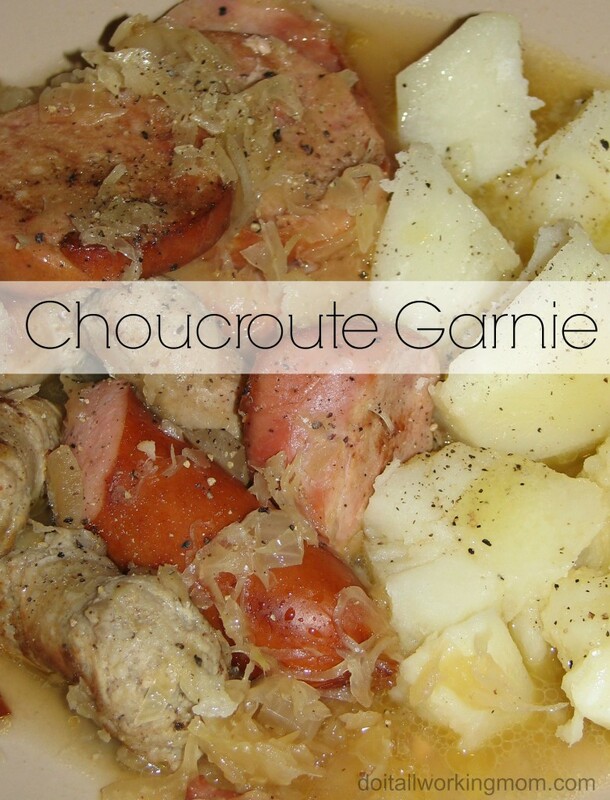 I have never heard of Choucroute Garnie and I’m sure I would butcher the pronunciation if I tried to say it aloud! I’ve never really liked sauerkraut but this looks delicious!